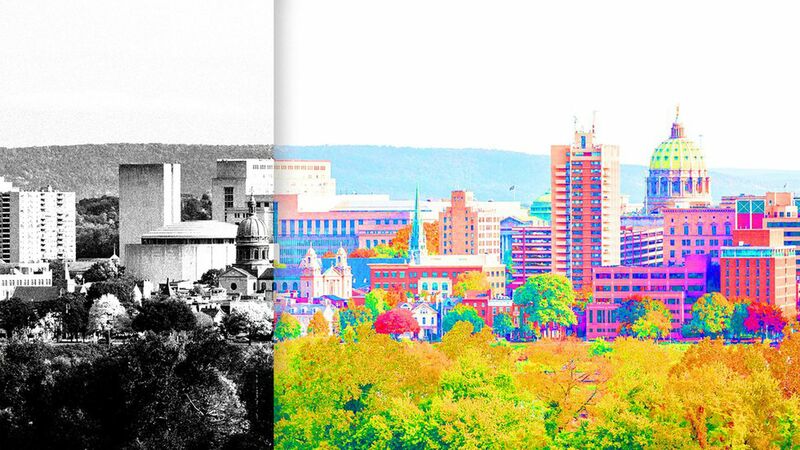 YORK, Pa. — For decades, Rust Belt cities have been seen as decaying manufacturing centers struggling to reinvent themselves. Now, central Pennsylvania — comprised of the smaller cities of York, Lancaster and Harrisburg — is trying to leverage its long history of manufacturing as the foundation for a vibrant robotics hub. Why we care: I visited these three cities as part of the "Rise of the Rest" tour led by Steve Case's firm Revolution, which aims to draw attention to the cities between the coasts that don't have the same access to capital and reputation for innovation as Silicon Valley, New York or Boston. Pennsylvania got about 1% of the nation's venture capital last year, a number Case would like to see increase. Factory history: The area has a long heritage of factories that crank out both sweets and pretzels. It's known as the "Snack Capital" — it's home to Hershey, Utz, York Peppermint Patties and Snyder's of Hanover. And it's a big producer of machinery, with Harley Davidson, BAE (which makes tanks) and Voith (which makes hydro turbines) all located here. He expects a "silver wave" of retiring baby boomer manufacturing workers — and their machinery expertise will be needed to train the next generation of robot-builders. "Most people think computer programming is the job of the future. That will leave out 99% of the population," he said. "Even as robotics becomes more prevalent, we'll need people to install the robots, repair them, put them together. And these are stable, middle-class jobs. Think less Facebook and more Ford Motors." Sharing workers: Central Pennsylvania, like other regions hit hard by economic forces and the recession, has suffered from two decades of "brain drain" as the best talent fled to opportunities in bigger cities. Tech talent is starting to trickle back into the area, but there's still a shortage. So a new startup model has cropped up to share the specialized workers they do have. Mike Monteiro, data product officer at Aspire (and former classmate of Mark Zuckerberg), showed off Connexion, a sensor-powered health booth that can detect your vital signs and health weaknesses through infrared and other sensors. Instead of each company at the incubator having their own fully built out teams, they "share" workers who have expertise in artificial intelligence, Internet of Things technology, software engineering, and even accounting and human resources. "When I was getting my MBA at Stanford, a professor said no world-changing innovation can come out of anywhere but Silicon Valley," Moteiro said. "I've made it my life's mission to prove him wrong." Dark Fiber: Advancing the high-tech ecosystem here depends on super-fast internet connections. York-based United Fiber & Data is building a 400-mile fiber backbone from New York City, down through York and Washington D.C. and on to Ashburn, Va., where 70% of the world's data traffic flows. That kind of infrastructure will help York attract more companies that need high-capacity fiber, said Kevin Schreiber, CEO of the York County Economic Alliance. A tale of three cities: The three cities, all located about 40 minutes apart, need to collaborate to better market the region's advantages in order to attract more capital, companies and workers, Case said. "While each city independently won't attract a high level of investment, the three cities working together can create a network effect," he said.